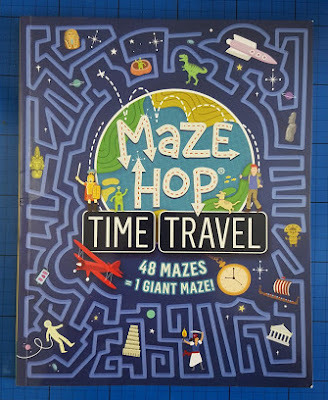 Maze Hop Time Travel by Anna Brett is another very different sort of book for children aged around 7+. 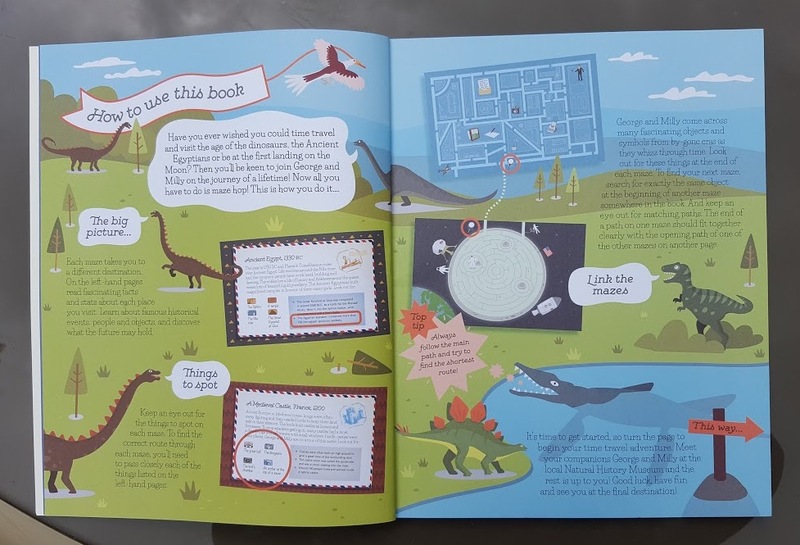 Including 48 mazes which connect from page to page, joining the characters George and his dog Milly, you weave your way through time from prehistory and dinosaurs to the present day and even beyond, with space tourism in the future. 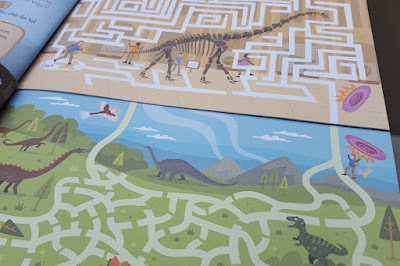 This is a lovely large format book which has 64 pages, most of which are split into 2 halves, each with a maze that connects to the one with the following time period. The pages are not in the correct order, it's up to the reader to find the maze which connects. This is also a genuine history book and the illustrations and text give an insight into each period in a way that is very accessible to all readers. Many important historical events and periods are included. Wars and inventions sit alongside dynasties and notable dates. The release of Nelson Mandela, the Ice Age, the Hanging Gardens Of Babylon and Imperial China are all included among the entries. 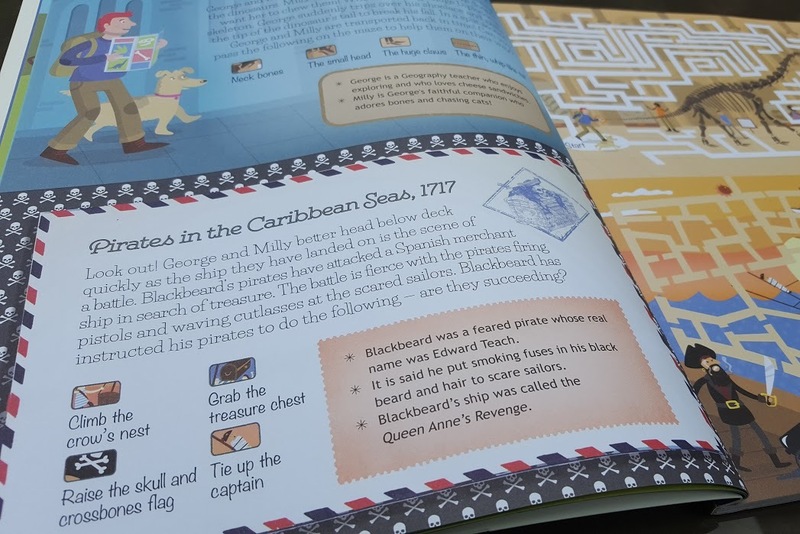 There are items to spot on each page, facts to learn and each maze itself is set into an illustration depicting the period. The illustrator Tom Woolley has a subtle, Lowry-esque style of drawing and can depict crowds and large spaces very clearly. It works perfectly as a setting for the mazes and actually his lack of close detail means each illustration can actually show far more of the 'bigger picture' - ideal in this case. The mazes are easy enough to solve, but pose enough of a challenge to make my boys competitive and the method of joining the timeline from page to page works well. The facts are relevant and interesting to children, and the illustrations bring day-to-day reality to life. 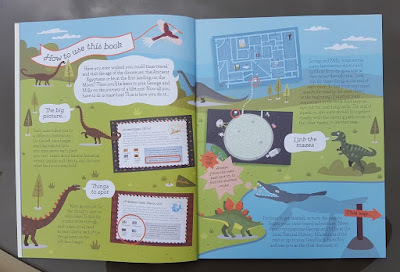 Maze Hop: Time Travel is written by Anna Brett, illustrated by Tom Woolley and is suitable for reading together with children aged around 4+ or for independent readers aged around 7+. Children of 11 will still enjoy this book and won't find it immature. 64 pages, rrp £7.99 and distributed by Carlton Books, where it is currently on offer at £6.39 (with free delivery for orders £20+). 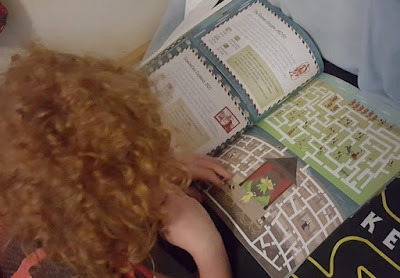 We were sent our copy of Maze Hop: Time Travel by Carlton Books for review.